We thought Spring had come to our little portion of Missouri, until we had a couple of inches of snow on Palm Sunday. I was ever so grateful our church congregation last year adopted a new schedule for confirmation since what would have been Amber's confirmation day dawned cold, windy and gray with huge snowflakes coming down rather rapidly. Of course, the snow was melted by Sunday afternoon, and we were back into the 70's for the beginning part of the week before returning to windy and cold by Thursday when we celebrated Amber's first communion. At least it didn't snow, so my mother and my sister's family could all attend Maundy Thursday service with us. 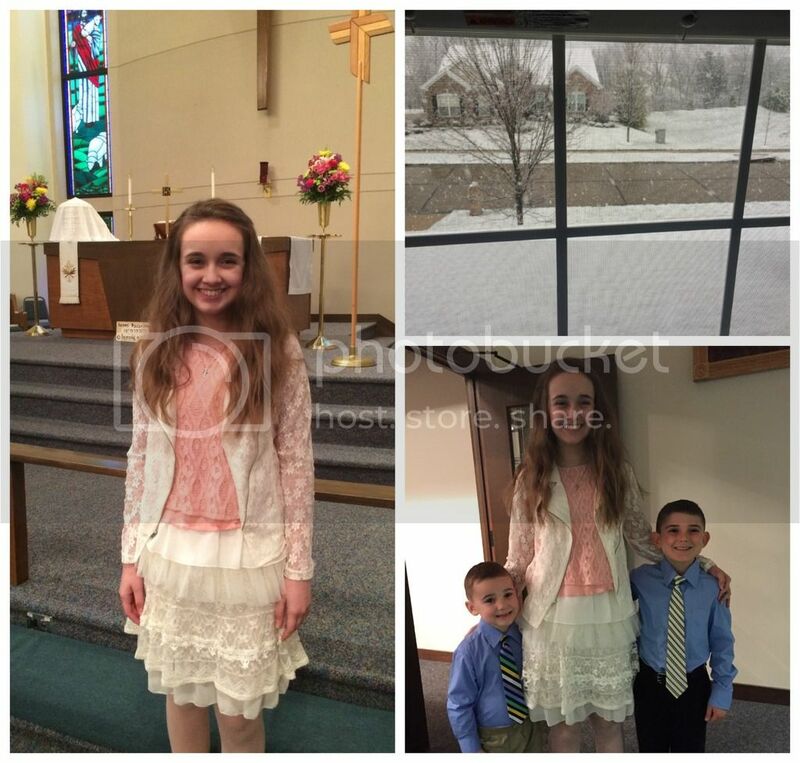 First communion on Maundy Thursday and snow on Palm Sunday. We've been happily busy this week with mostly non-medical issues and only two regularly scheduled medical appointments. Although we've still had an active week that allotted considerably less school time than is optimal, it was glorious to not be dealing with medical issues all week. Wednesday we took time to attend the homeschool group's Easter party at a local park. 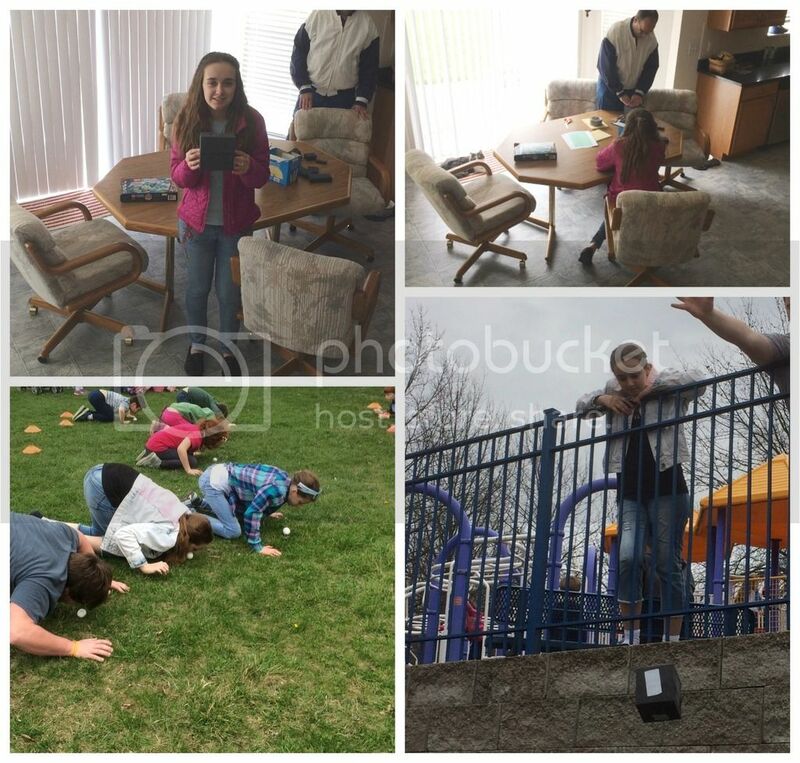 Although Amber didn't participate in the Easter egg hunt portion, she did help a friend who is also on the yearbook committee take pictures of the younger kids. However, Amber and her friend did roll hard-boiled eggs with their noses, try to win the egg toss (they did not succeed), and each had an entry into the egg drop. Amber's was one of only two entries in the egg drop that did not result in a broken egg, however she ended up with second place because at 56 grams her contraption weighed a bit more than the other child's. It was a fun few hours and entirely worth the time away from lessons. Ready to trial the egg holding contraption (AKA the Borg Cube), and then some minor adjustments. The egg roll race at the party and watching her device during the egg drop. We did skip out on a couple of the afternoon co-op classes this week, because time-wise it just didn't work to get home, let Amber rest a tiny bit, get her ready, eat dinner and get back to church for her first communion service. Amber was sad to miss her improv drama class, but your first communion only comes around once in a lifetime and she'll be back in classes next week. School this week still focused on review items, mainly language arts. 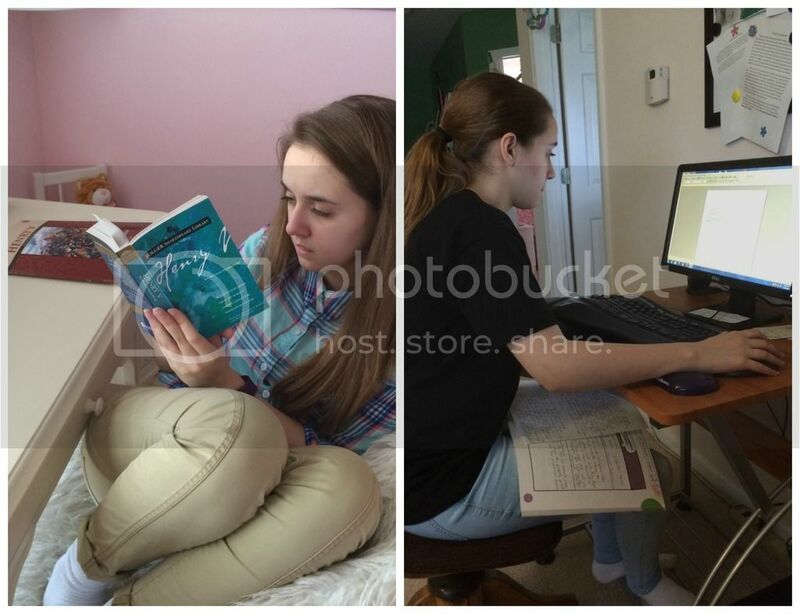 However, Amber has been taking some Great Courses DVDs in the car with her lately to finish up her Greek and Roman Technology class from co-op that she dropped to make time for yearbook. 4 blocks of writing - she's rather enjoying Writers in Residence, although we started towards the end of the curriculum. Amber finished the augmentin for her gastroparesis on Tuesday and so far she feels there hasn't been much change off of the medication. Although we try to give her easy to digest food, this is great news and we hope her stomach continues to contract without assistance for a good while. Cooking with Grandma: working on a roux for made-from-scratch baked macaroni and cheese, plus Italian breaded chicken. Next week we are back to extra medical appointments, including a lengthy one with the orthopedic department to check out her back, as requested by the pediatrician. Unless things change, we have just two more weeks of over scheduling before life might get back to a more normal load of outside events. I can't hardly wait to just sit at home and work on school lessons. 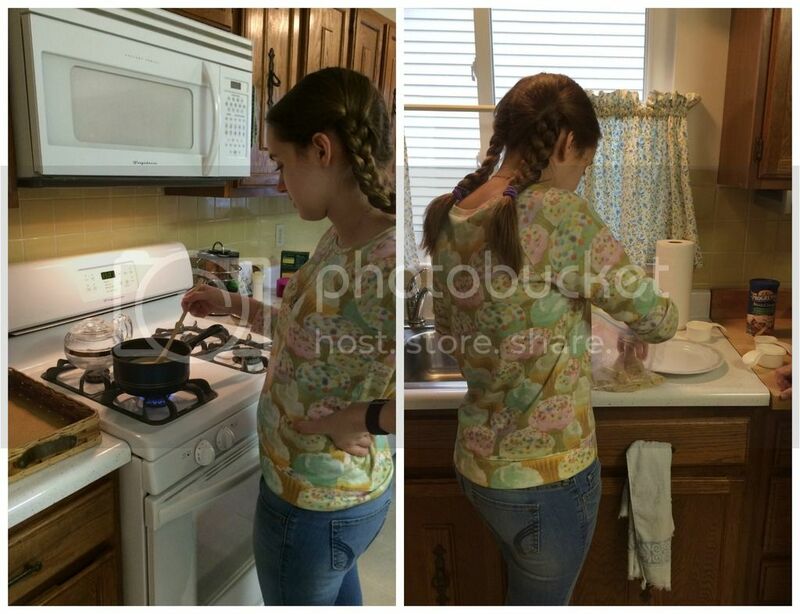 I love all the egg activities your group puts together; what a fun way to celebrate Easter! Sounds like a wonderful week. Oh and your daughter looks beautiful; I love her communion outfit. All that lace is just beautiful. Wish you, Amber and the family a very Happy Easter! Hopefully normal routine and schedules will get here soon! What a delight for Easter party. Happy first communion. I am glad you all had such a great week. I just happened across your blog. We are also in the STL metro area. My 7 year old is recently diagnosed with EDS. He also has GI issues and receives PT & OT through Children's. They have been wonderful! We don't homeschool but our son is in the school connected to our LCMS church. I will definitely be following! Small world! Glad to have you following. Children's has been wonderful for us too, as long as you get the right provider who knows what EDS is. We had an orthopedic nurse practitioner just yesterday who was, at best, barely aware that the condition exists; at worst, she actually told us things that are not true for EDS patients. Thankfully, it didn't really affect the appointment because we were just there for xrays and we pretty much disregarded her opinion. I'm so glad to see that you had a pretty good week and that the augmentin seems to have done its job! Hopefully that will continue! Congrats to Amber on her first communion! She looks beautiful!